Home » Estrel’s Caramel Cakes New! Estrel's caramel cakes are baked on the day of pick-up.Since they are without added preservatives, we recommend that you order 3 to 5days before. FREE delivery!.Comes with FREE greeting card. Please kindly read the delivery policy before process the order?? 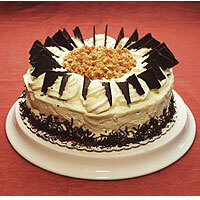 •Cake will be delivered directly from the Estrel's caramel cakes. Your recipient will get it fresh. Your Free Greeting Card might be delivered separately through Express Courier and may arrive earlier or later than the actual cake. •philhearts is committed to ensure fastest FREE Delivery in the industry. Our state of the art logistics enable us to select most suitable route, vehicle type and courier all in a matter of seconds when you place your order with us. Please provide the complete address (house number, street name, barangay, city, province) together with the phone number of your recipient. Without the phone number,delivery might be delayed. This is to ensure fast and safe delivery and to protect our valued customer from possible fraud. 1) We recommend to place your order 3/4 days prior to selected flavor and delivery otherwise we will replace with available flavor which is equal or higher value than your order. 2) Delivery charge are included with the Display Price. 3) "Same-day" delivery is not applicable during Some occasion like - Christmas, New-year, Valentines, Mothers day and father day. 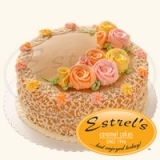 4) Please note that Estrel's caramel cake delivery only metromanila. 5) We require to provide the phone number of the recipient. We might inform your recipient prior to delivery. 6) Substitution is applicable with high value item if ever item is not available in the market. 7) Item will be deliver upon the request of the sender's preferred delivery time if the order is processed one week before. 8) In-correct addresses: the company is not liable for delayed delivery or missing item. 9) Our cut off time is 10 Am Local. Orders received after cut off time will be processed on the following day.